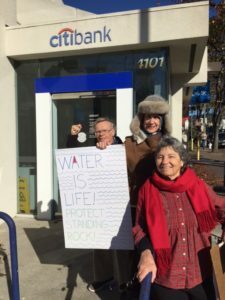 Alameda Interfaith Climate Action Network activists were last out distributing flyers about Standing Rock, calling on Citibank customers to transfer their deposits out of Citibank to socially responsible credit unions and local banks. Citibank, Wells Fargo and many other large banking institutions are financing the Dakota Access Pipeline, which cuts through sacred and sovereign territory of the Sioux nation in North Dakota. Its current planned route is under the Missouri River. Because oil pipelines nearly always have spills, the Dakota Access Pipeline threatens to poison local water, as well as water downstream that supplies millions of people with their drinking water. The response from customers was surprisingly enthusiastic. Most sympathized with the Standing Rock tribes. Yes, they agreed, water is life; Mother Earth is sacred. Some said they would cancel accounts. Others agreed to mail divestment letters. One Pueblo woman said she was fighting within the Teamsters, a union that supports the pipeline. Standing Rock has struck a cord. Such is the power of prayerful nonviolence combined with economic non-cooperation. Alameda County is home to many CIPL member congregations. In June, 2015 a group representing different faith traditions gathered to begin the process of forming an East Bay CIPL Working Group. In July and August 2015 the team hosted at different houses of worship in Alameda County an interfaith study group of Pope Francis’ encyclical on climate change. Check out a guide based on their discussion series.